Yesterday morning, the Pro Football Writers of America released a statement on the matter. Emphasis is mine. "The Pro Football Writers of America, the official voice of pro football writers fighting and promoting for access to NFL personnel to best serve the public, is extremely disappointed in the lack of meaningful access to Seattle running back Marshawn Lynch at the Super Bowl XLVIII media day on Tuesday. Several of our long-standing and high profile members were appalled by Mr. Lynch's conduct and refusal to answer any questions. We find the statement that by the league that "Players are required to participate and he participated" to be an affront to our membership. However, we are encouraged that the league will continue to closely monitor this situation." Appalled? I know it's easy to rag on the media, but you've got to be kidding me. It would be "appalling" had nobody from the Seahawks, or the Broncos, spoken to the media, or only spoken to local media, or specifically ignored certain outlets or reporters (and even then, the word seems too much). But this was one guy. I don't think that failing to get a quote from Lynch will cause any reporters to lose stories, or their jobs. What may be the best part is the third block complaining about how the league was satisfied that Lynch participated (which he did, giving one brief interview to renowned interviewer Deion Sanders) and that it is "an affront to our membership." What the hell do they want, Lynch to do a song and dance? Although that would be awesome, the guy doesn't like to do the media. He showed up, completing the minimal requirements, avoided getting fined, and that's that. And quite frankly, if I were running the NFL, I wouldn't mandate that players have to show up if they did not want to. Everybody knows that Super Bowl Media Day is an absolute joke. Everybody. Plus, it is not the only time that the media has access to players, there are plenty of opportunities over the course of the week. Sometimes journalists need to realize that not everyone is as good in front of the cameras or as quotable as say a Richard Sherman or a Peyton Manning. And it's not the end of the world. 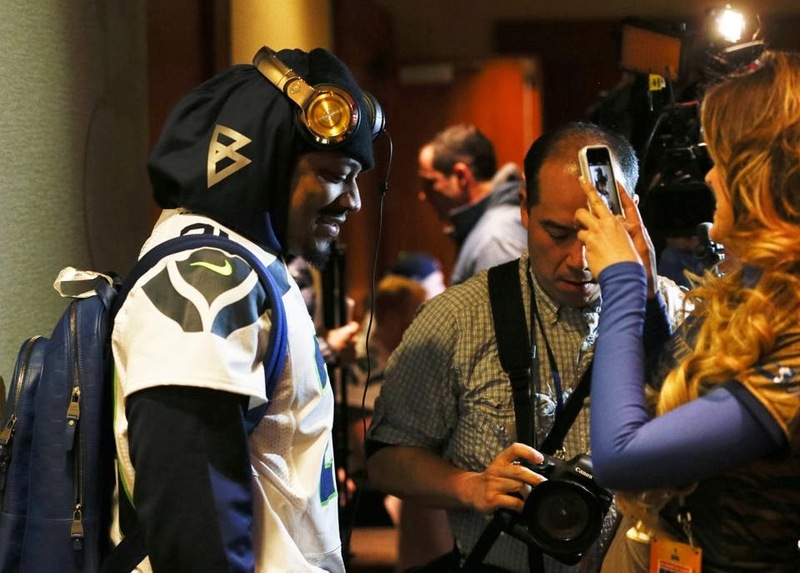 Journalism is not going to die if Marshawn Lynch does not want to speak. So maybe we should stop trying to act like it is.